I met Thomas Rosica some time around 1997 whilst he was at the Newman Centre in Toronto. I was asked to assist another musician in the teaching of Gregorian chant. The meeting with him was unremarkable and it occurred once when he hired me and others to sing a black-tie concert just after Christmas for some special guests. This was in addition to the Saturday afternoon chant classes. In 2011, I wrote to complain about his public comments criticziing Catholics as "extremists" and "Taliban Catholics." The email went to info@saltandlighttv.org. It was not too many hours after, an insulting and degrading response came from him. Over the next month, I received more than a dozen emails that were derogatory, insulting, demeaning and one that was potentially threatening to my livelihood. It stopped when I wrote him and warned him that any continuous harassment from him would result in an action on my part to stop him. Months later, out of the blue, without contact in five months and without provocation and whilst in Madrid at World Youth Day with Pope Benedict XVI, he found the time and considered me important enough that he should write again. I responded and advised him that I would be filing an offical complaint against him with the Judicial Vicar of the Archdiocese of Toronto and the Congregation of St. Basil; and, that his email would be published on this blog in an effort to stop the continuous harassment. Here is that email, word for work with only my personal address removed. Vox, I don't know what the other letters say, so I can only judge by this one. Father Rosica is being a jerk. Catholics should never delight in the sufferings of others. But there's nothing out of the ordinary with the letter, and it is certainly a more subdued letter than the flame wars I've seen on the internet on a typical forum. My suggestion is to just place Father Rosica in your spam filter. You do yourself a disservice by stooping to his level. As the old saying goes, never wrestle with a pig....you'll get covered in filth and the pig will enjoy it. As for the CNA article, it looked like a hatchet job to me. Voris is not in the position to have any answers, and repeating this statement makes Voris look like an incompetent fool. Lumping in Simon Rafe's alleged extracurricular activities makes it worse. On top of that, adding the "lack of approval from event organizers" makes it sound like the Church is actively against Voris. CNA needs to be called out on this piece of yellow journalism, true or not. Vox: Get those letters posted here soon. I'm on deck and ready to swing. Rosica is a sick, sick man that needs to step down already. 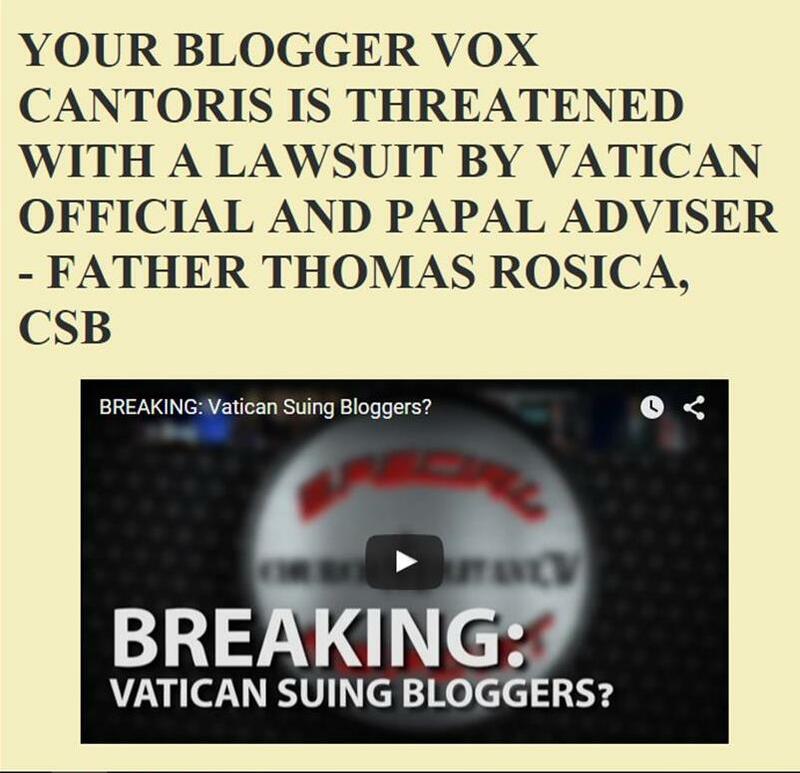 Rosica, apologize to all Latin Mass goers, go to confession, and hand in your collar. Enough is enough. Fr. Rosica... I'm not sure what Simon Rafe's evil doings have anything to do with Voris. Those are Rafe's sins, not Voris's. From what I understood, Rafe was hired because his wife/fiancee was working there first. Voris must have taken the wife's word. Rafe should resign, but Voris, keep up the good fight! Fr. Rosica, why don't you do something useful, like pray more Rosaries, rather than bully a lay person? Oh...I guess you don't believe in the Rosary either, huh? Who needs Our Lady, when social justice will save us all. One should be able to defend themselves against unwarranted personal attacks such as those Vox has endured. This priest needs our payers to be sure. In charity, his unbecoming behaviour needs to be and should be called out. Should read "needs our prayers"